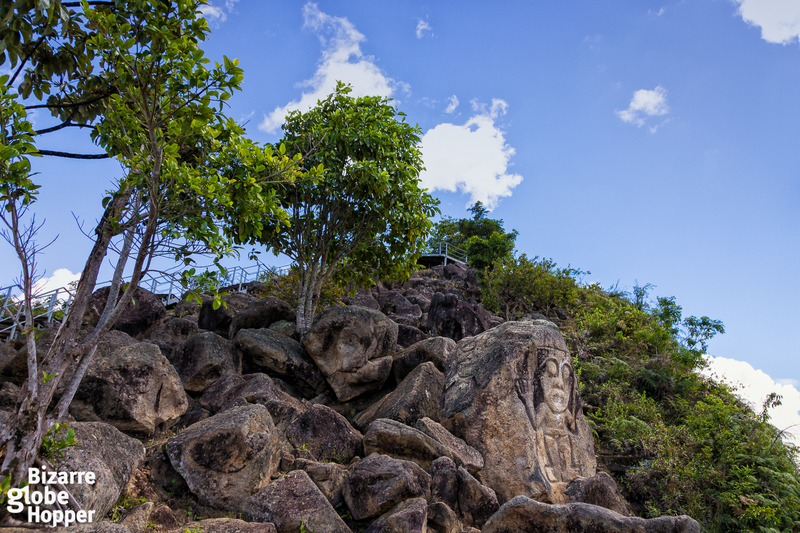 Ancient statues and tombs, built approximately somewhere between the 6th and 14th centuries, spot the hillsides around San Agustín in Colombia. The best way to explore these mysterious carvings is by horseback. 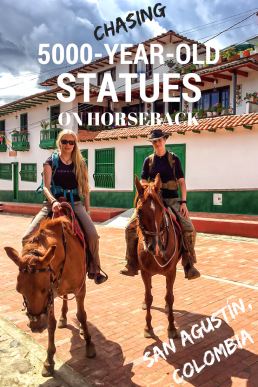 I was adapting to the movement of my horse, galloping through the muddy roads to see some ancient statues spread on the hillsides of San Agustín, a little town in the department of Huila, Colombia. The wind had a crisp blow even though it was a sunny day. I smelled the familiar scent of the horses, heard the creaking of the leather saddle below me, and I felt pure happiness. It was just me, my spouse, and our guide, a local man around his sixties with wrinkles around his face and a soft voice, on our brisk horses traveling from one archeological site to another. For me, this was the perfect way to spend a day. 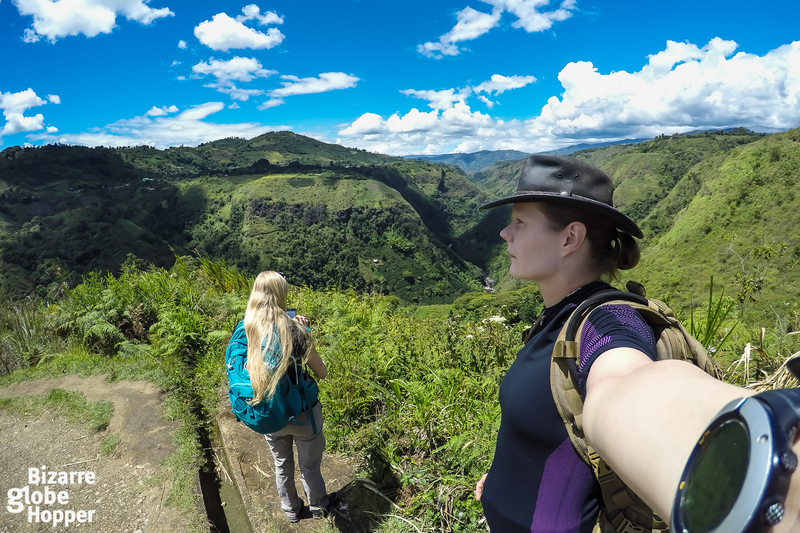 We encountered other travelers only a few times, on foot and on horseback, but mostly we got to keep all the sights to ourselves. The worst of the crowds have still not found this beautiful place, even though this vast area around San Agustín is said to be one of the most important archeological sights of whole South America. 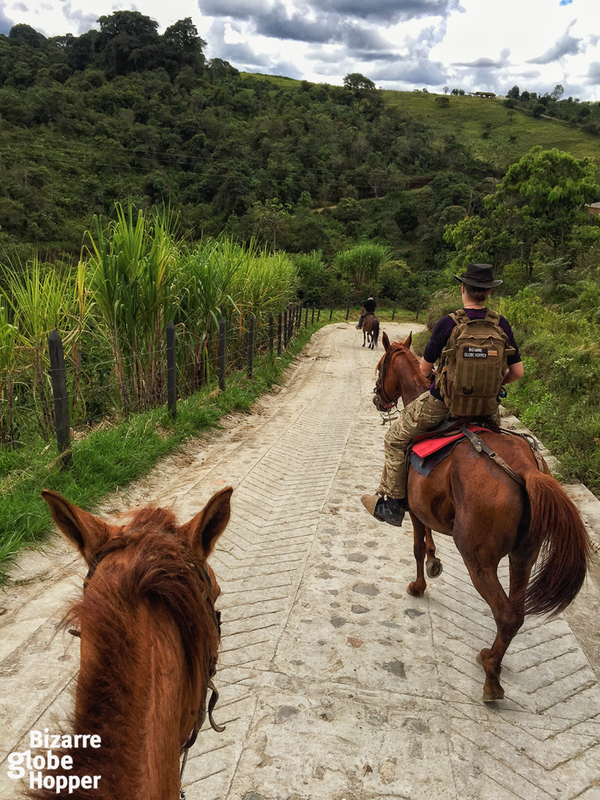 Definitely, the best way to explore the archeological sights of El Tablon, La Chaquira, La Pelota, and El Purutal is by horseback. All these four sites are part of the big San Agustín Archeological Park. You can also do the tour by foot, but then it’s going to take at least double the time than with horses. It took us about 4-5 hours to visit all the four sites, and there were pretty comfortable roads where you could also occasionally gallop a bit. The tour cost 140 000 COP (Colombian Pesos) for the two of us as a private tour. That was equivalent to approximately $48.25 (at the time of writing this). I think we could have been able to haggle the price down a bit if we would’ve tried, but sometimes the few extra thousands of pesos mean more to the locals than they mean to you. Your money will also straightly benefit the community, but the decision is always yours. We were also happy to notice that we had good horses. They seemed to be well cared for, and they were fast, too. However, we specially asked for fast and fiery horses because we have more than 10 years of riding experience and then you’ll appreciate the challenge. But rest assured, most of the horses are really reliable and even if you’re not an expert rider, you can definitely go on this tour. Your guide will match you with a gentle horse, and you can even travel just by walking or by trotting only a little. You can also hook yourself up with a group instead of a private tour. 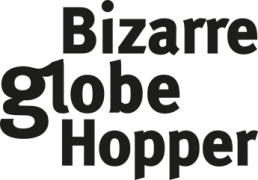 Then the price would be approximately 50 000 COP / per person ($17.25). So it’s possible for anyone to experience this magical place by horseback. Aguila, the Eagle, a symbol of wisdom. 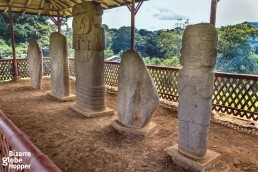 San Agustin Archeological Park, Colombia. 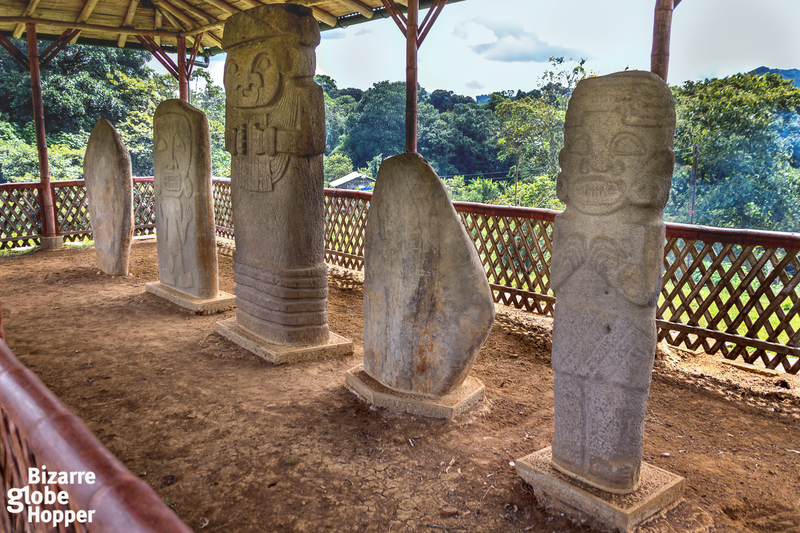 The first site we encountered was El Tablón, where three statues, each over one meter in height, greeted us from under a wooden roof. Between them, the fourth one had been conquered by time and had fallen on its back to the sandy ground. 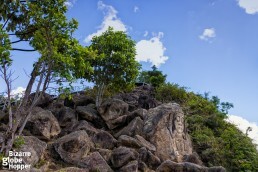 Each of the figures had been carefully carved into a light gray stone, representing some familiar deities like the Pacha Mama (Mother Earth). One of the characters we came across many times during our time in San Agustín was the “Aguila” (Eagle) who held a snake at its peak. Aguila stands for wisdom, and it seemed to be a vital deity among the mysterious societies who built this monumental site nowadays called the San Agustín Archeological Park. La Chaquira was the second site, and it was different from the other three. After about a 15 minutes ride we came to a little restaurant built like a pit stop on the riding route and left our horses in its yard. Our guide waved us to follow him. Behind the restaurant were some stone stairs on a steep hill and we started to descend towards a stunning lookout. On our way down we could see the Rio Magdalena running about 200 meters below us as a narrow stream in the gorge, in the midst of the green forests. The skies were clear, and we could see all the way to the end of the horizon. We stopped many times to take some photos of this beautiful scenery, as to remember it better. Check out the video about our horseback riding tour! Boards were missing from the wooden stairs every once in a while, and I could see the drop in between almost too clearly. No matter how beautiful the scenery in front of me was, I also had to concentrate on watching my step. Even the planks which were still in place had cracks in them. The stairs in their slowly crumbling state made me feel like the place would’ve been long forgotten, even though we weren’t the only people there. “Look, here you can see the carvings in the rock,” our guide said. I turned my eyes to the direction where he was pointing at, and I saw the fascinating faces in the stone. Here they were exposed to the elements all the time with no shelter. However, I made a mental note that they looked like they wouldn’t have had any erosion. After admiring for awhile the views and the rock carvings from the observation decks, we climbed back up to the restaurant to have a moment’s rest. When we got back to the saddle, our horses felt refreshed, and we were ready to gallop again towards the next site. In La Pelota, we met the familiar figure of Aguila, the Eagle again. It was under the roof with two other figures. One of them was a human, but the other had fallen face down, so we could only guess what it was representing. Our longest ride was to the last site called “El Purutal.” It’s also the main attraction of these four locations. We rode about 20-25 minutes via paved and unpaved roads. Our guide trotted even on the tarmac, and when the horse’s hooves were clipping against the asphalt, I always felt bad. Through all my youth when I was a semi-professional rider, I was always taught not to trot on the tarmac because it’s harsh for the horse’s joints. Here in Colombia I just had to tolerate it. There was an additional, 3000 COP/per person admission fee to El Purutal. In a little, wooden shack was a guy selling snacks and water and collecting the entry fees. We left our horses in the comforting shade of the trees and continued the short hike to the statues on foot. Behind a green, little hill emerged another roofed statue site, and we saw some colors flickering from the shadows under it. 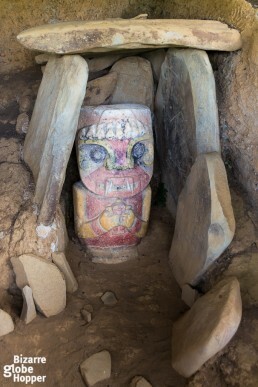 In El Purutal there are the few colorful sculptures, which have been preserved until today. Most of the colorful ones have lost their attractive coloring during the centuries. So it’s a rare treat to still see them here in El Purutal. 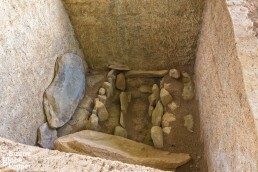 The two, fiercely looking statues bearing red, white, black, and yellow colors stand guarding the graves of which one is excavated, revealing the structure of the tomb, made out of slabs of stone. 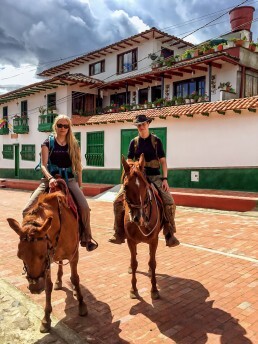 Piritta and Niina Riding in San Agustin, Colombia. 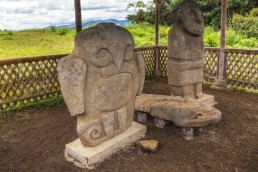 Half of the fun of this tour was riding in the tranquil countryside with good horses, but even if you wouldn’t have much interest in archeology, these prehistoric statues will arouse your imagination. They sure woke ours!  Maybe it was the mystery that surrounds them and their origins – something that even the best archeologists haven’t yet been able to figure out. During the day we rode from one sight to another, sometimes on the mud roads and sometimes on the tarmac when cars, tractors, and motorcycles rushed by us. Locals smiled and waved to us many times when we rode by their houses and various dogs accompanied a part of our journey. It was as much a calming day for my soul as it was an adventure to explore the centuries-old, beautiful statues hiding on the hilly scenery. Unfortunately, our guide wasn’t able to tell us much about the statues, but he managed to spill just enough information that it got me even more excited about this exquisite archeological site. I just wished that my Spanish wouldn’t have been so broken that I definitely missed a part of his story. The horses in San Agustín were notably better cared for and in a better shape than the horses we saw in Tayrona National Park. They also had reasonably good saddles and bridles, which made riding pretty comfortable. But still being in the saddle for many hours takes a toll on your leg muscles. 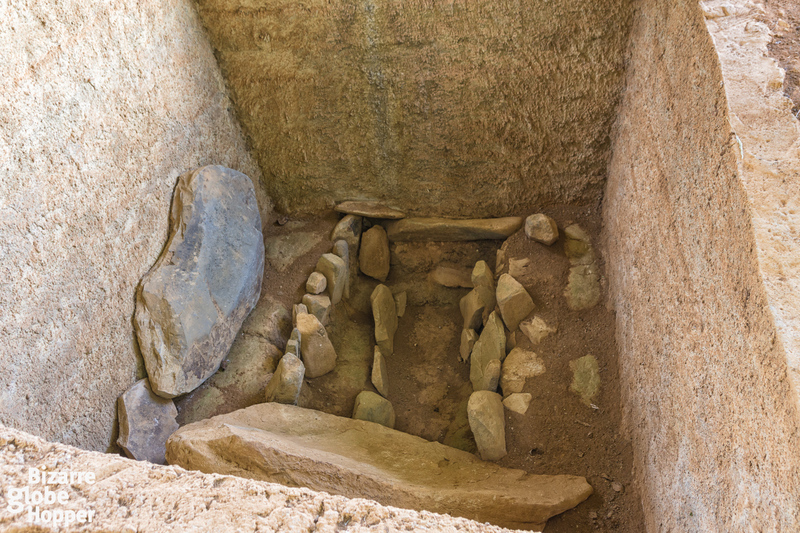 However, that’s a small price to pay for an exciting day that will take you through the centuries, to the heart of a long-lost civilization, who thrived here thousands of years ago and made hundreds of intriguing guardian statues on their graves. Map of San Agustin, Archeological Park, Colombia. 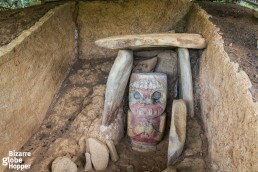 An excavated grave in San Agustin Archeological Park, Colombia. 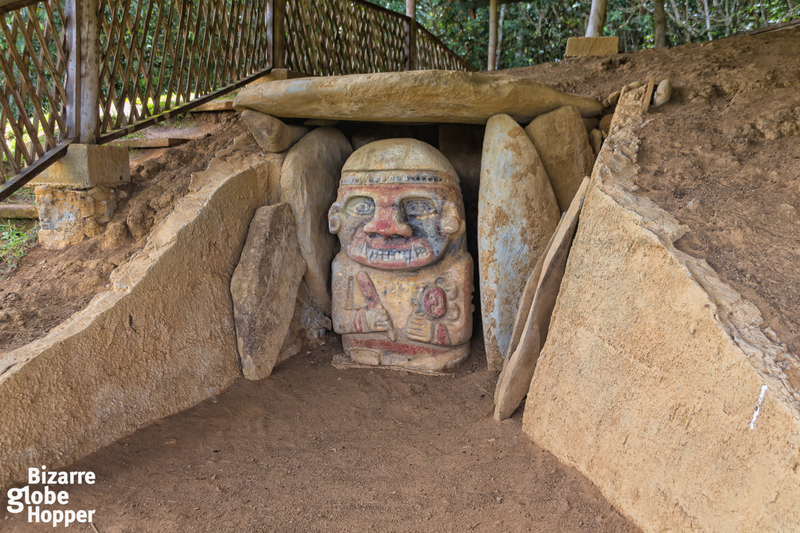 Aanother one of the few colorful statues in San Agustin Archeological Park, Colombia. 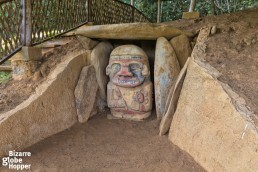 A colorful statue in el Purutal, San Agustin Archeological Park, Colombia. A private riding trip costs 70 000 COP/per person (booked through our hotel, Terrazas de San Agustín.) Group tours will cost approx. 50 000 COP/ per person. You can haggle a bit if you want to. 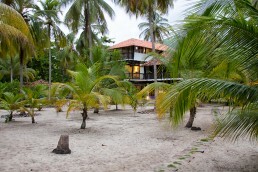 Book through your hotel or via the official tourist office on the Calle 5. Do NOT book via the several touts in town who will try to charge you approx. 200 000 COP for a private tour! Duration is about 4-5 hours. Horses are in good condition, with good equipment. Also rapid, a bit more challenging horses available. Wear comfortable pants with minimal seams and good shoes. Don't forget a hat, sunscreen, and plenty of water! Tickets to San Agustín cost 30 000 COP/per person from Popayán and Neiva. Several companies drive the route with public minibusses; i.e. Taxi Verde, CooTrans, Sotracauca, etc. 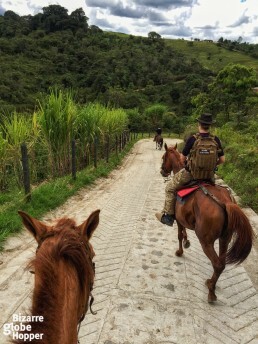 Laidback beach hopping, pre-Colombian ruins, and scenic horseback riding routes – Tayrona National Park shakes you with drastic beauty. Check out our Beach Hopping Guide to Tayrona National Park to squeeze everything you can into one-day exploration! Smell out the affordable luxury hotels from the big cities like Medellín and Bogotá, and discover the genuine boutique hotels from the remote corners of Colombia, such as the Amazon! 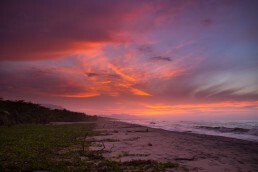 Discover the splendors of Colombia on a 4-week itinerary winding through paradise beaches to the roots of ancient civilizations and infamous kingpin Pablo Escobar, branching at the high-altitudes, mysterious mini-desert, and the jungles of Amazon! 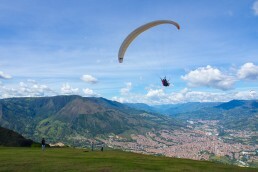 Domestic flights in Colombia can be dirt cheap. There’s just one problem: foreigners get ”tourist prices”. Check out our flight hacks and save some serious bucks!